Most of us would have a panic attack standing hundreds of feet up in the air, hovering above a bustling city. 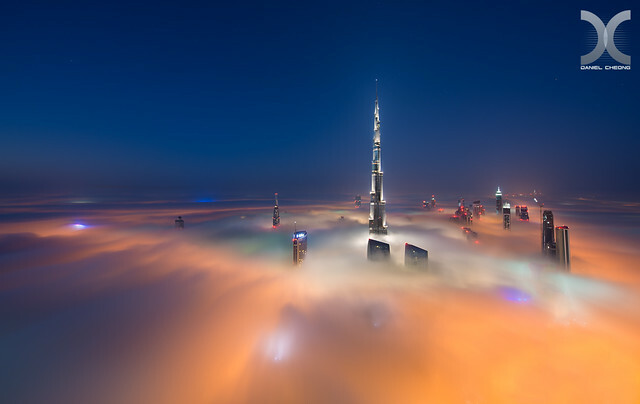 But for Daniel Cheong, known on Flickr as DanielKHC, there’s no bigger thrill than “rooftopping” — a heart-stopping photography movement which involves daring photographers climbing to the top of city skyscrapers, capturing incredible and adrenaline-pumping views beneath them. Living in Dubai, Daniel is surrounded by some of the most architecturally beautiful and tallest buildings in the world. Apart from a couple of photos he took from a helicopter, all his shots are taken from high balconies or rooftops. Daniel describes being up so high as an exciting experience that offers spectacular 360 degree views that most people would only dream of. It helps that he isn’t afraid of heights. Daniel, however, does encounter dangerous and unpredictable situations on his shoots. What makes Daniel’s photos so captivating is they border the line of surrealism. He does this purposely by using a process called digital blending, which consists of combining multiple exposures of the same scene (but taken at different shutter speeds) to create a High Dynamic Range (HDR) image. One of Daniel’s favorite photos to capture are called “vertigo views” which is simply shooting the camera looking down but away from the building. This style of photography is striking and incredible, but it can induce a sense of vertigo, which Daniel says has caused some of his viewers to feel uncomfortable. One of the scariest experiences Daniel’s ever had was shooting a vertigo view called Glamorous. Today on Flickr, Daniel has over 20,000 followers and over 10 million views. The challenge he faces is to produce a new image that’s better than the last. He constantly strives to find new rooftops, angles and viewpoints that inspire viewers. Visit Daniel’s photostream to see more of his photography. Previous video episode: Check out the stunning Arctic photos from a photographer who braves subzero temperatures.